The beauty of the National Park lies in its sixteen lakes, inter-connected by a series of waterfalls, and set in deep woodland populated by deer, bears, wolves, boars and rare bird species. The National Park covers a total area of 300 square kilometres, whilst the lakes join together over a distance of eight kilometres. If you’re undecided about whether or not to visit Plitvice Lakes, take a look at any photo album of the Park and that will surely sway you! The official Plitvice Lakes website has a fantastic virtual tour that features some truly stunning scenes. 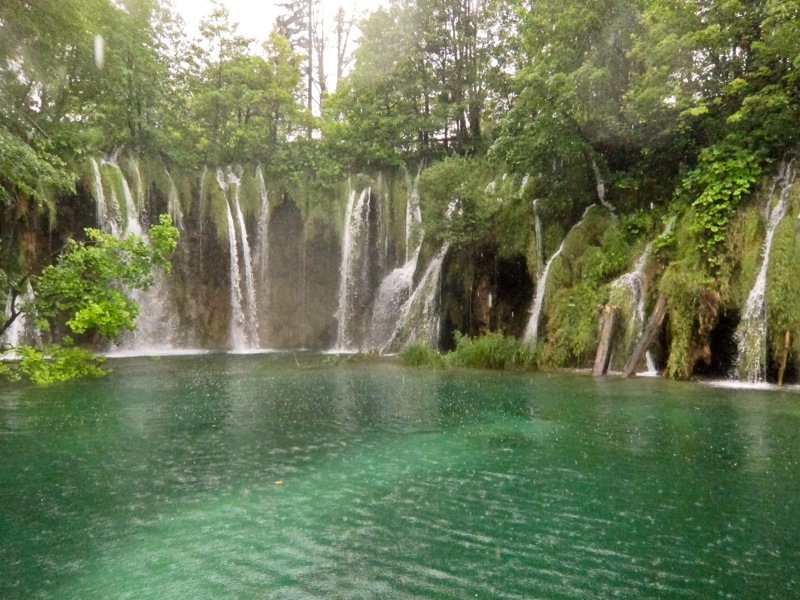 Or, for another prewiew, check out our Plitvice Lakes Photos! See our page on Getting to the Plitvice Lakes National Park for details on how to get there by public transport or organised excursion. If you’re driving to the Park, there is parking at both entrances. It costs 7 Kuna per hour for cars. The Park is open daily all year round, with longer opening hours during summer (usually 7am to 8pm). There’s an entrance fee which acts as a contribution to the Park’s upkeep and protection: for adults it’s 55 Kuna (£6.50/€7.50/$9) January to March and in November and December; 150 Kuna (£18/€20/$23) during April to June and in September and October; and 250 Kuna (£30/€34/$39) in July and August. If you visit in July and August after 4pm, tickets are discounted – tickets after this time cost 150 Kuna. Children aged 7 to 18 have cheaper tickets, whilst children under the age of seven go free. Students also get discounted entry, and groups of 15 or more (whether adults, students or children) can also get discounts. 2-day tickets for the Park can also be purchased, which provide you with some cost savings. 4-hour guided tours in English, German, French, Spanish, Italian or Croatian can also be pre-booked for a minimum of 15 people at an additional cost. There are two entrances to the Park – excitingly titled Entrance 1 for the lower lakes and Entrance 2 for the higher lakes. Entrance 2 (and therefore some of the park) is normally closed in winter (November to April). Full details of ticket prices can be found on Operating Hours and Prices page of the Plitvice Lakes National Park website. 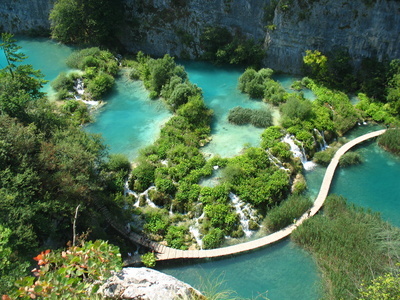 See our special page on Exploring the Plitvice Lakes National Park. Plitvice Lakes isn’t just for summer. It’s a stunning place to visit any time of year as the different seasons see the Park take on different hues, whether that’s lush greenery in spring/summer, rich colours in autumn, or magical scenes in the snow and ice in winter. Even if conditions are rainy, the park can still be wonderful to explore as the water takes on a dramatic effect – sometimes bubbling up underneath your feet on the wooden pathways! Understandably, Plitvice can get very busy during summer and the pathways can be quite crowded. We’d ideally recommend a spring/late summer visit when the weather is still good, the park is open for relatively long hours but there should be fewer people. Do note that Entrance 2 (higher lakes) is normally closed in winter – but there’s still plenty to explore from Entrance 1. It is possible to stay right next to the Park at one of its three hotels (which are all clustered quite closely together by Entrance 2) or at its campsite, Camp Korana (which contains bungalows or space for 500 camping units), which is about 7km from entrance 1. Another campsite, Camp Borje, is 15km away from Entrance 2. There is another hotel, the Hotel Grabovac, that is also located 12km north of the Park. See our Accommodation in the Plitvice Lakes page for a detailed listing of all of the above options. Please see the official Plitvice Lakes National Park website.